I was hanging out with some friends yesterday afternoon as they played boardgames prior to a night out. 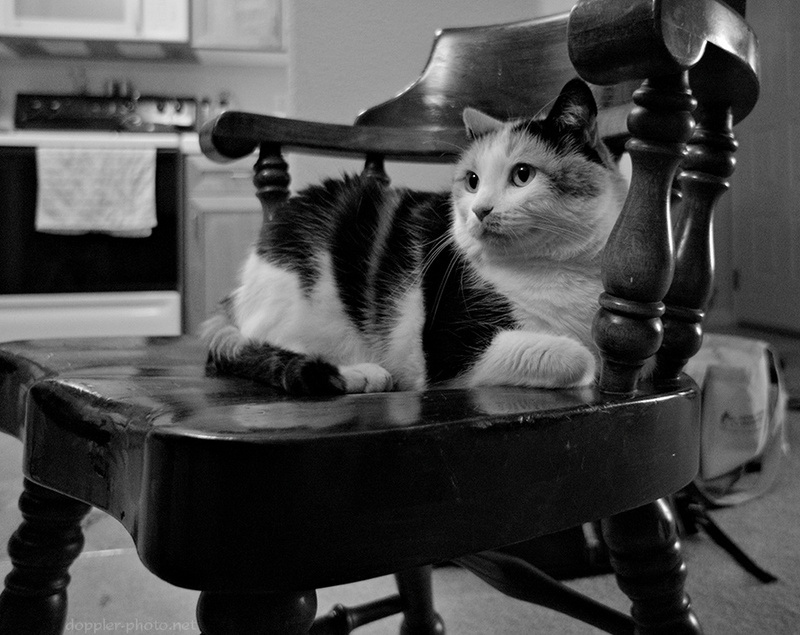 Of their two cats, this is the social one, Frida (after the painter). What's true of humans also seems to hold true of cats: if you stick a camera in their face and wait awhile, they'll forget you're there. Either way, I think this is one of the best cat portraits I've ever taken, alongside "My Precious…". Hey, it's Tina again! 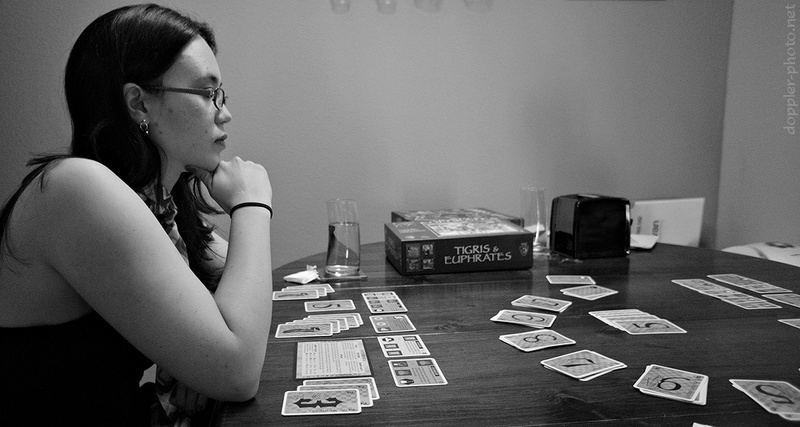 This time, she's playing a quick game of Innovation against our friend Brian right before a fancy dinner. These shoes belong to Candice, and I really like them. 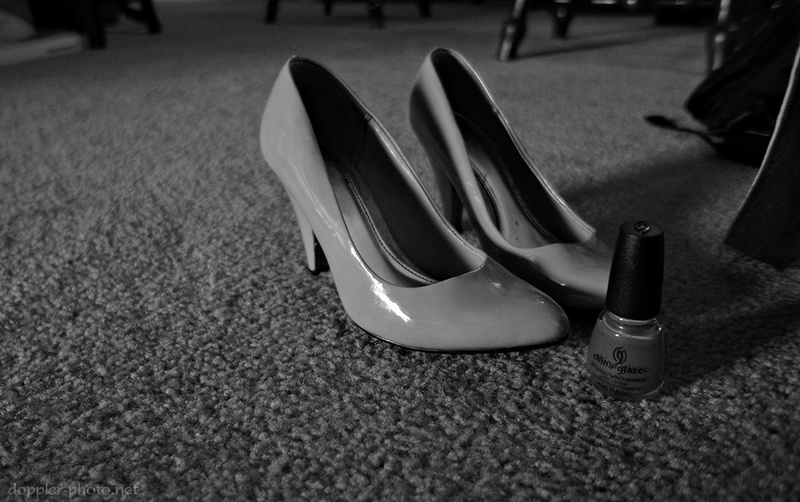 They're a bright (but not dazzling) shade of pink, and were sitting next to a slightly darker pink bottle of nail polish. I like how the monochrome conversion turned out — you can't really tell the color, but I think they still look pretty lustrous. There were two overriding colors of light in this shot, and I used the channel mixer to predominantly pick up the hard blue light coming from a large window at camera left. I really like how the shoes are tonally isolated from the background (which didn't pick up as much of the blue); the warmer overhead light was hitting everything pretty evenly, which made it hard to pull the shoes away from the background.